Harp stands can be used to accomplish a variety of purposes. Our lap harps, the Harpsicle®, Sharpsicle™, Flatsicle™, Fullsicle™ and Special Edition Fullsicle™ Harps do not stand on their own. If you would like the harp to be vertical when you are not playing, a Harpsicle® Display Stand is the answer. 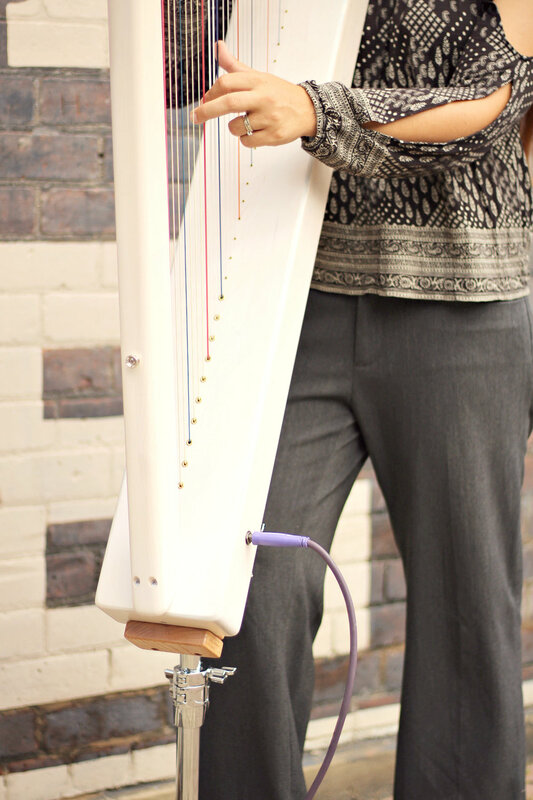 If you are not comfortable holding a harp in your lap you can try a Harpsicle® Stick or a Harp Strap or our Adjustable Harpsicle® Harp Stand. If you would like to be able to stand and play either one of our lap harps or even our Grand Harpsicle® Harp, well, we have stands for that too! You get the idea, no matter what you are looking for, we have a stand for that. The Harpsicle® Display Stand is the perfect way to hold your Harpsicle® brand lap harp while you are not playing. Some folks even use the display Stand when small children are learning to play. The Stand locks your harp into place to keep it safely upright. Minor assembly is required but we really do mean “minor” so no fear! This stand fits the Harpsicle®, Sharpsicle™, Flatsicle™, Fullsicle™ and Special Edition Fullsicle™ harps. 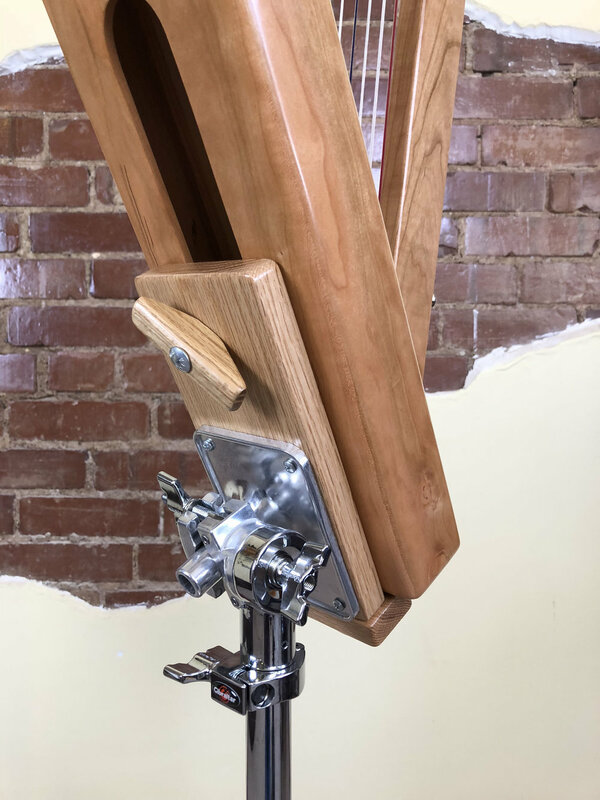 The Adjustable Stand for Harpsicle® Harps turns your Harpsicle®, Sharpsicle™, Flatsicle™, Fullsicle™ or Special Edition Fullsicle™ harp into a floor harp, making it easier for the harp to be played, displayed, and to stand on its own. The Adjustable Stand takes the balancing act out of holding a lap harp, making it easy, and more accessible for everyone. This sturdy Adjustable Stand pivots the Harpsicle® Harp to different angles and adjusts to different heights for a perfect fit. The bottom of your harp can be elevated from 10" to 18" off the floor. The harp can be adjusted to be played while all three feet of the stand are firmly planted on the floor or it can be adjusted so that the harp and stand can be tilted back together on two feet with the raised foot pointing away from the player. This stand is only available in natural wood with metal legs. For stability reasons this stand does not raise high enough to be used for playing while standing. 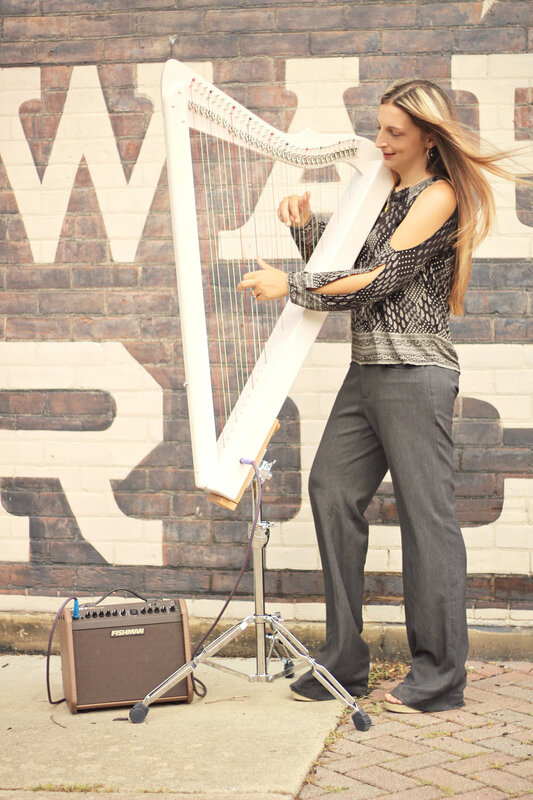 Melissa with a Special Edition Fullsicle™ Harp on an Adjustable Stand. Melissa uses the Adjustable Stand while Marilyn supervises. 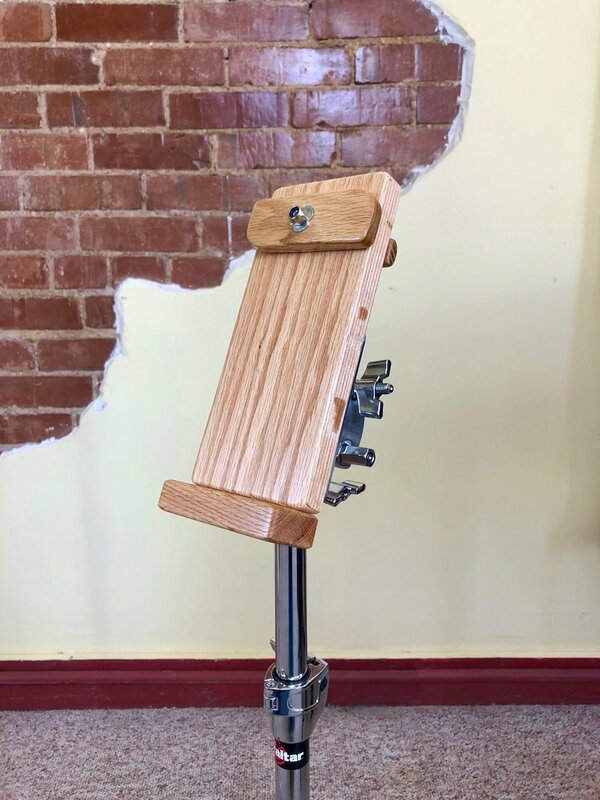 The Standing Stand for Harpsicle® Harps turns your Harpsicle®, Sharpsicle™, Flatsicle™, Fullsicle™ or Special Edition Fullsicle™ harp into a floor harp that you can play standing up, making it easier to be played, displayed, and to stand on its own for your performances. This incredibly sturdy Standing Stand pivots the Harpsicle® Harp to different angles and adjusts to different heights for a perfect fit. The bottom of your harp can be elevated from 24" to 34" off the floor. Only available in natural wood with metal legs. Ashley with a Sharpsicle™ Harp in the Harpsicle® Standing Stand. She is also using a ZT Lunchbox Junior Amp and an Asterope Hi Def Cable. A close-up of the back of the Harpsicle® Standing Stand. Harpsicle® Standing Stand, front view. 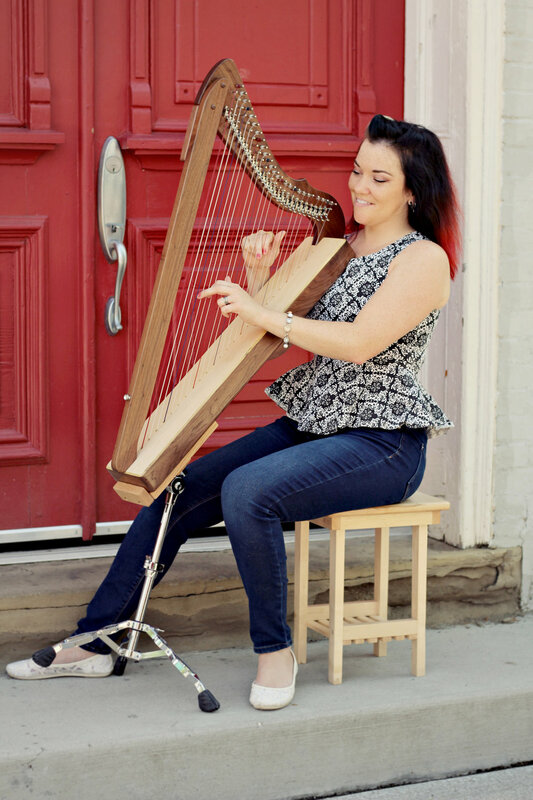 The Grand Standing Stand for the Grand Harpsicle® Harp elevates the harp so you can play standing up, making it easier to be played, displayed, and to stand on its own for your performances. This incredibly sturdy Grand Standing Stand pivots the Grand Harpsicle® Harp to different angles and adjusts to different heights for a perfect fit. The bottom of your harp can be elevated from 19" to 29" off the floor. Only available in natural wood with metal legs. This works with the Grand Harpsicle® Harp only. Ashley with a Grand Harpsicle® Harp in the Grand Standing Stand. She also is using the Fishman Loudbox Mini Charge Amp and an Asterope Hi Def Cable. Garen with a Grand Harpsicle® Harp in the Grand Standing Stand. He also is using the Fishman Loudbox Mini Charge Amp and an Asterope Hi Def Cable. A close-up of the Grand Standing Stand with a Grand Harpsicle® Harp.